I know every single WordPress.com user got a report for 2011, but this is my first year having a blog–it’s all new to me! It’s been a great year and looking forward to more adventures in 2012. I already said my thanks earlier this year, but I really appreciate you taking the time to read my blog. Here’s to 2012– a leap year, the year of the dragon and a summer Olympics year! I’ve been wanting to start a blog for awhile but have been intimidated for a number of reasons: 1) I lack any type of artistic abilities, 2) Going hand in hand with artistic abilities, I lack creative writing talent, 3) The time factor worried me, and 4) What happens on the internet, stays on the internet (forever!). What magically changed my mind? It’s true that my artistic abilities haven’t improved, but I was given the opportunity to use WordPress more at my job and kind of learn it on the fly. I figured it’s a lot better to screw formatting on my own blog than screw up things on the website of a major organization. I still don’t think I am the strongest writer, but I find writing therapeutic. For all you foodies out there, you can understand how writing a Yelp review can be therapy. I like writing restaurant reviews during my lunch break and I find myself relaxed and happy afterward. I wanted an outlet where I could write about more than just food. The time factor is still an issue so I’m not making any promises. There is no goal of “I will post once a week” because I will not meet that goal. I’m just going to say that I will write as often as I feel inspired. Let’s face it… you’re probably not going to want to read about the mundane details of my life either. There’s no use trying to hide my identity. Everything is connected with Facebook, Twitter, LinkedIn, Google+, etc. I’ve just come to the conclusion that there’s no use hiding when I’m one Google search away. So what is rbjello? Rbjello = Rainbow Jell-o. What was the inspiration for this wonderful screen name? Well, I was in 6th grade and trying to come up with a screen name for an AOL account. I don’t know how it popped into my head, but I started thinking about “Layer Jell-o” (more to come below) and how it looks like a rainbow. And BAM, Rbjello was born. It’s been with me since I was 12 and it looks like it’s not going anywhere. Rbjello has ALWAYS been available on every single thing I’ve ever opened an account on and it’s never failed to disappoint me. Yahoo! Mail recently congratulated me on being a customer for 12 years with that name. It made me feel old (and I am not). OK, you’re probably wondering what is Layer Jell-o. I am so glad you asked because Layer Jell-o represents everything that is good and wonderful in this world (not to mention also delicious). It’s a time-consuming dessert made with jell-o and condensed milk. 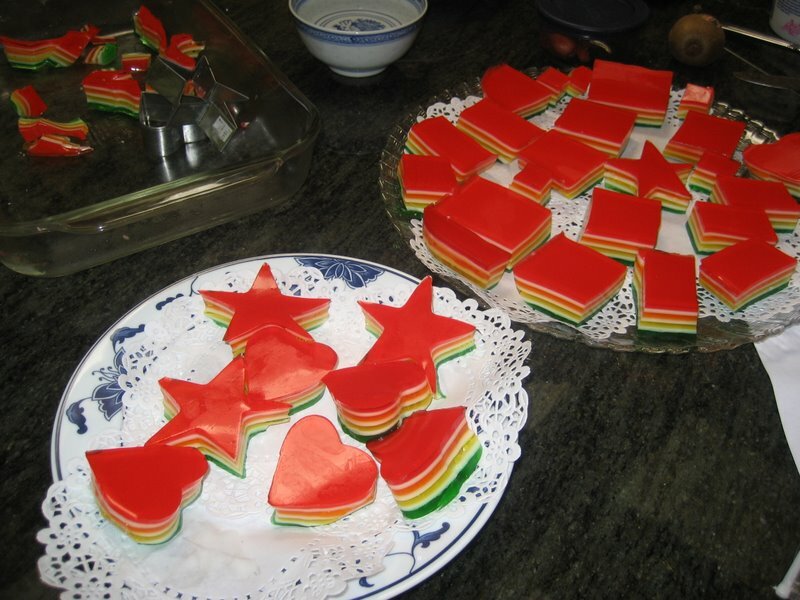 You have to do each layer one by one and make sure it sets before adding the new one; otherwise, you will not have layer jell-o–you will have blob jell-o.